"Strike Blazinger" strives to create a compelling universe that evokes a modern take on sci-fi RPG's - with post-apocalyptic dystopian story and visual parallels reminicent of shows and anime such as "Bubblegum Crisis", "Genesis Climber Mospeada", "Star Blazers", "Attack on Titan", and "Battlestar Galactica". The planet Aerumia was colonized by an uprooted remnant of human society that wandered the stars for eons in search of a home. With rich resources found in the abundant energy particle "Aerspark" in the atmosphere, and the mysterious life-adaptable "gridformed" properties of the planet, the displaced colony began to rebuild their society. An era of prosperity lasts for a millennium, until a sudden and terrible outbreak decimates the population. Mutation gives rise to fearsome creatures who consume the planet's limitless energy and relentlessly attack any survivors. Those who are able to evacuate flee to an orbital colony and bide their time in order to find a solution. 10 years after the evacuation, an attempt to take back the planet through military force fails. However, it is discovered that those born off-world are immune to the outbreak. After the failed reclamation, another plan is put into motion, with improved technology and a new generation of warriors ready to take back the home they never knew. 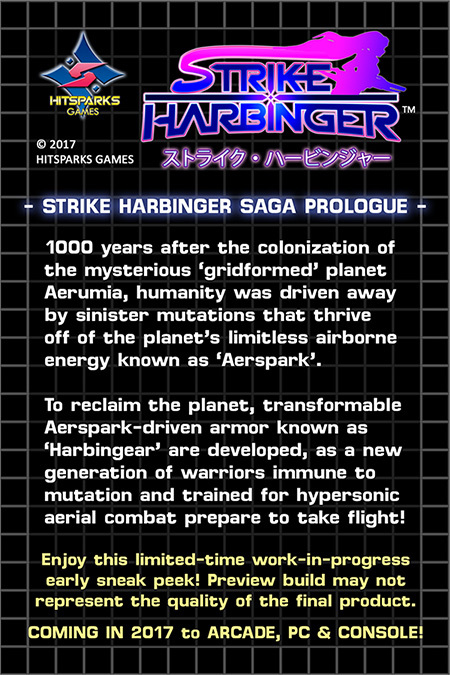 Transforming flight armor known as "Harbingear" blast-process the Aerspark, providing powerful weapons and hyper maneuverability to neutralize the enemy and pave the way for the return of the exiled colony.